Brûlerie D'Alré's history is based around an ongoing search for quality. Rich in expertise and with an inherent uncompromising tradition, the company has maintained an innovative spirit, always in search of the best, with a subtle dose of magic and passion. Their expertise is constantly evolving thanks to their diversified approaches to coffee roasting. You will find on MaxiCoffee a great range of Brûlerie d'Alré's delightful coffees : ESE pods or coffee beans. 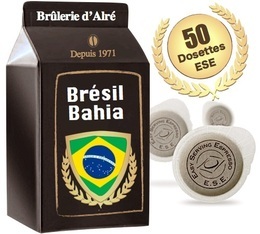 Discover the Brazil Bahia ESE pods by Brûlerie d'Alré. The box contains 50 pods of this light coffee. Enjoy tasting this high-quality coffee! Discover the Moka Yrgacheffe ESE pods by Brûlerie d'Alré. The box contains 50 pods of this smooth coffee. Enjoy tasting this high-quality coffee! Discover Brûlerie d'Alré's organic Peru Campiña ESE coffee pods. The box contains 50 pods of this light coffee. A real tasting moment guaranteed! Discover the Jamaica Blue Mountain ESE pods by Brûlerie d'Alré. The box contains 50 pods of this balanced coffee. Enjoy tasting this high-quality coffee!